The UK has a serious shortage of nurses and for the first time in recent nursing history 27% more UK registrants left the register in 2016-2017 than joined it. Emergency nurses are particularly affected as their environment is unpredictable, fast-paced and increasingly crowded. 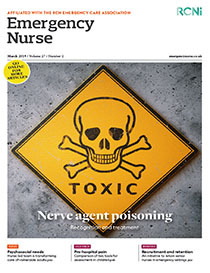 This article reports the results of a study of a successful initiative to retain senior emergency nurses in a London trust.